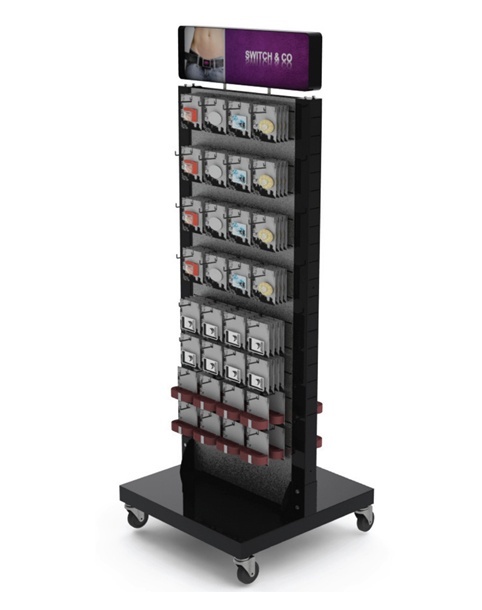 This is the second in a 2-part blog series on custom POP displays. 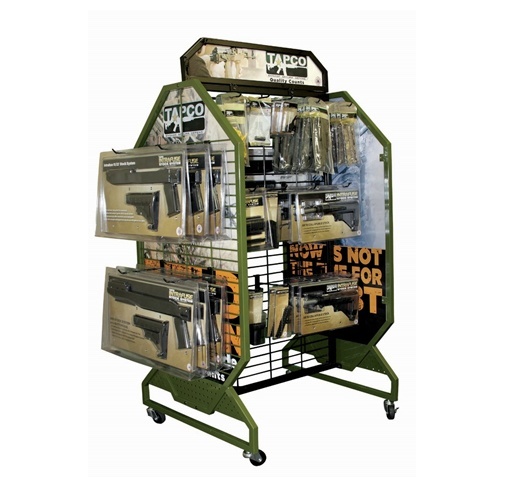 We’re specifically focusing on retail floor display that can accommodate a broad range of products. In Part I of our series, we showed 10 examples of floor displays that shared a number of the same characteristics. Most importantly, all of the featured displays were very affordable options. In today’s post, we’ll show another 10 floor display examples. These will begin to get more into what we would consider mid-range displays from a pricing standpoint. 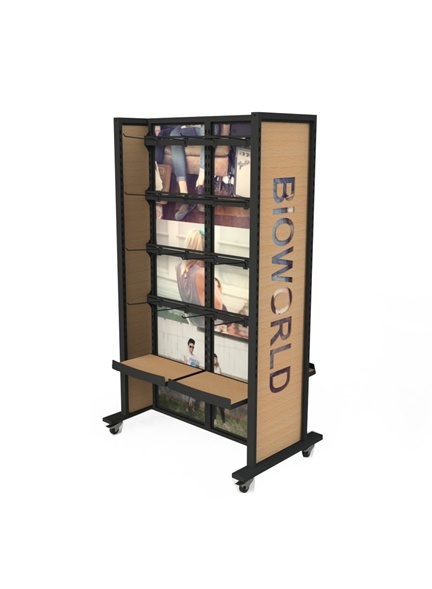 Our first example is a 2-sided slatwall display we designed for Bijolie’s line of footwear. This is actually a customized version of our SW-62FL stock slatwall display. The display has a black melamine finish with aluminum extrusions. 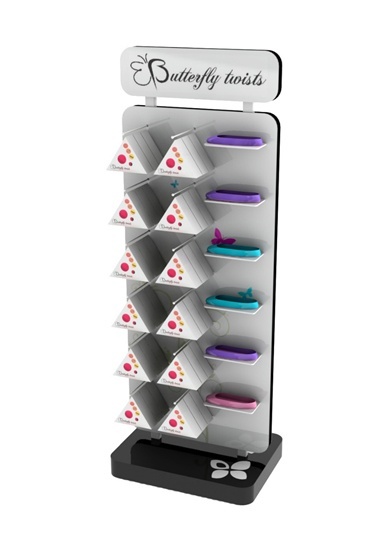 It features an explanatory graphic in the main body, 1 custom shelf, and a series of peg hooks to hang product. It also includes a PVC header sign. Second, we designed the 2-sided floor display shown below for Butterfly Twists. It was built using a metal tube base and frame. The base had a vacuum formed cover, and the main frame was covered by front and back white MDF panels with vinyl graphics. The hooks and shelves were in fixed locations, and the header sign was MDF with a screen-printed logo on both sides. Our third example is an adaption of our SFL-H rack. This knock-down design consists of 3 identical metal tube frames with locking castors. The frame is slotted so as to be able to accommodate apparel bars or other accessories. The unit below is shown with belts, but the same design can work with a number of products or accessories. We added 3 header signs for branding. This display is really the poor man’s version of our SFL unit since it does not include panels in the frames, which would have added additional cost. Our fourth example is a 2-sided display with an MDF base on castors, center MDF panel with slots to accommodate metal hooks, and a header sign with direct printed acrylic graphics on both sides. Fifth is a weapons gear display we designed for Tapco. 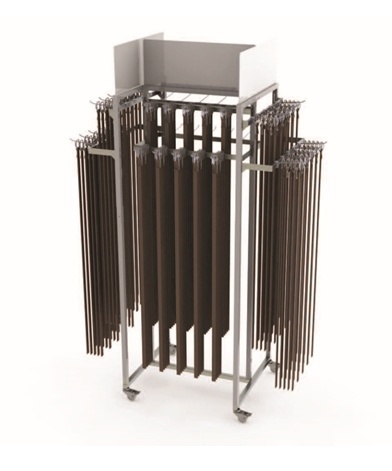 This high-capacity unit is made of the wire grids and a header frame. The 2 side frames are identical, include castors, and have backdrop graphics. The header has a metal tube frame and 2-sided PVC graphic. The frame is powder coated a camouflage green, and all of the hooks are adjustable. 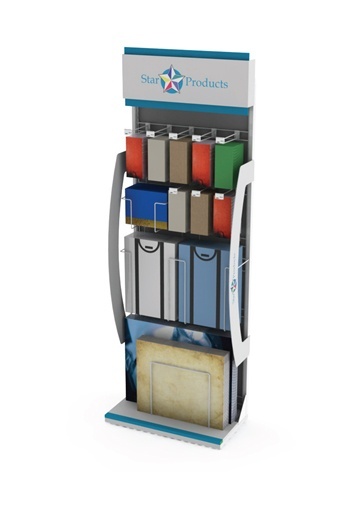 Number six below is a shared end cap display for office products that we designed using a sheet metal and tube frame, PVC backdrop panel, PVC side borders, wire product holders and hooks, and a sheet metal header. Our seventh example is another adaptation of our stock SW-62FL slatwall display. This is one we designed for VANS. 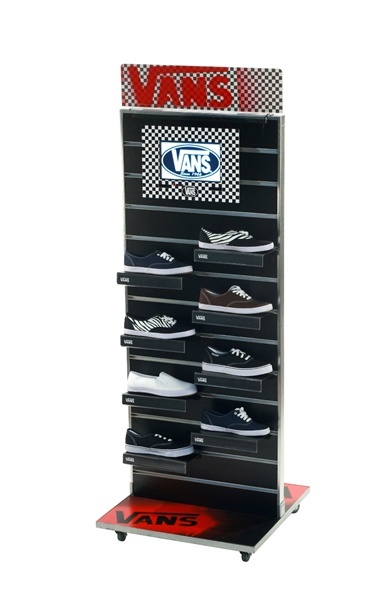 We started with our standard stock black slatwall unit and added the cool VANS logo stencil on both sides of the base. We printed a PVC header sign and panel graphic with a hanging slatwall attachment. We used standard shoe shelves from our stock line. 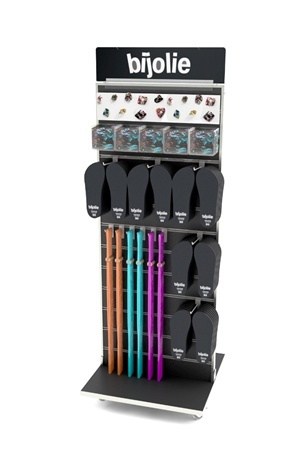 The end result was a good example of how stock fixtures can be adapted to become well-branded custom POP displays. Our eighth example is another variation of an H-rack using a square metal tube frame with castors. The horizontal crossbars were designed to accommodate shelves, hooks, face-outs, and other merchandising accessories. There are two things that make this display stand out: (1) the back panel graphics, and (2) the cut-out logo on the wood side panels. Our ninth example is a good illustration of how a standard slatwall display can be branded and made more interesting. We designed this one for Skechers. 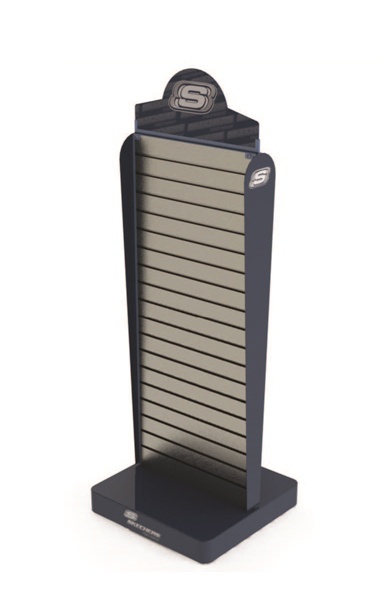 The display had a metal base, but we designed a branded vacuum formed cover to go over the base. We added PVC side signs that were uniquely shaped and then finished the display with a die-cut PVC header. 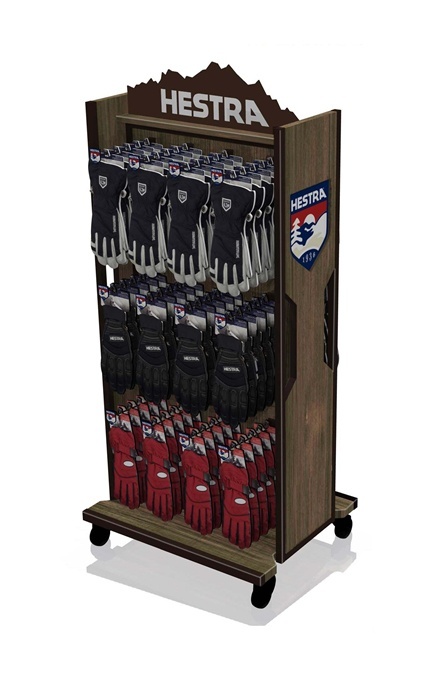 Our final example is a high-end glove display we designed for Hestra. We used a brown powder coated metal tube frame and added slide-in CNC-routed side panels with screen printed graphics. We also included a matching wood base panel and slotted back panel that could accommodate hooks for the gloves to hang. The wood header was designed to portray the rugged outdoors. We added white acrylic laser-cut letters for the Hestra logo. Any of the above examples can be easily customized to accommodate different types of products, branding, and retail environments.